The March issue of Military History Monthly, the British military history magazine, is on sale today. Marking the 70th anniversary of the Battle of Monte Cassino, Patrick Mercer begins a four-part analysis of the pivotal struggle of the Italian Campaign. MHM Editor Neil Faulkner explores the inner workings of the Habsburg Empire in the lead-up to the First World War. William Wallace ‒ The Great Patriot? Jeffrey James assesses the career of another of Scotland’s greatest leaders, William Wallace, in the context of his two greatest battles: Falkirk and Stirling Bridge. Continuing our Road to War series, Julian Spilsbury takes us deep into the labyrinth of early 20th-century Balkan politics. MHM looks into the hidden weapon of the desert Arabs, and its efficacy through the ages. Also in this issue: War on Film; Recommended Read; Thinkers at War; Your Military History; Book Reviews; Museum; Conflict Scientists; and much more. The First World War marked the start of the modern era. It was destined to sweep away half the states in Europe. Antiquated autocracies, broken by the strain of industrialised war, would fall like skittles in 1917 and 1918. Yet many of them entered the war precisely to avoid such a fate. Despots from another age, who found themselves under siege from socialists and nationalists at home, hoped that foreign war would unite their countries. For a while it worked. The flags came out in July and August 1914, and millions went to war imbued with a chocolate-box image of what it would be like. But after years of carnage on the battlefields and hunger at home, Europe exploded into revolution. We begin our series on the five Great Powers that went to war in 1914 with one of those that would not survive: the creaking dynastic empire of the Austrian Habsburgs. 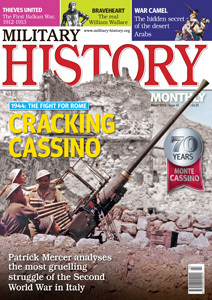 We also anticipate the centenary with the first of two articles by Julian Spilsbury on the savage Balkan Wars of 1912 and 1913, and our Second World War feature this time is the first of a short series by Patrick Mercer analysing the long struggle for Cassino between late 1943 and the end of May 1944. With a nod towards the Scottish independence referendum later this year, Jeffrey James assesses the military career of William Wallace. For our final feature, we take a thematic look at the role of the camel in war over some two millennia – and discover the technological secret of its long supremacy in the desert.